This document is written to help inform assessments of water protection for compliance with the Quality Standards. Water Protection of modern off-grid lighting products is a key determinant of long-term durability and consumer satisfaction. There are two strategies for protecting products from water: product design and user behavior. 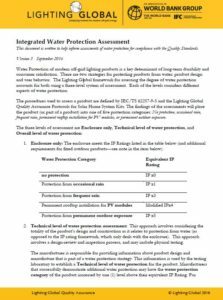 The Lighting Global framework for assessing the degree of water protection accounts for both using a three-level system of assessment. Each of the levels considers different aspects of water protection. The procedures used to assess a product are defined by IEC/TS 62257-9-5. The findings of the assessments will place the product (or part of a product) into one of five protection categories: No protection, occasional rain, frequent rain, permanent rooftop installation for PV modules, or permanent outdoor exposure.